At first make small balls with this mixture. Then for the curry, stir fry the onions, garlic and ginger till golden brown. And Mix in the rest of the curry ingredients with enough water to make a gravy. 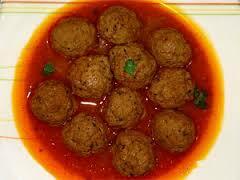 Then bring it to a boil, mix in the fried koftas and simmer (boil slowly at low temperature) for 45 mins. Decorate with cut coriander leaves before serving.